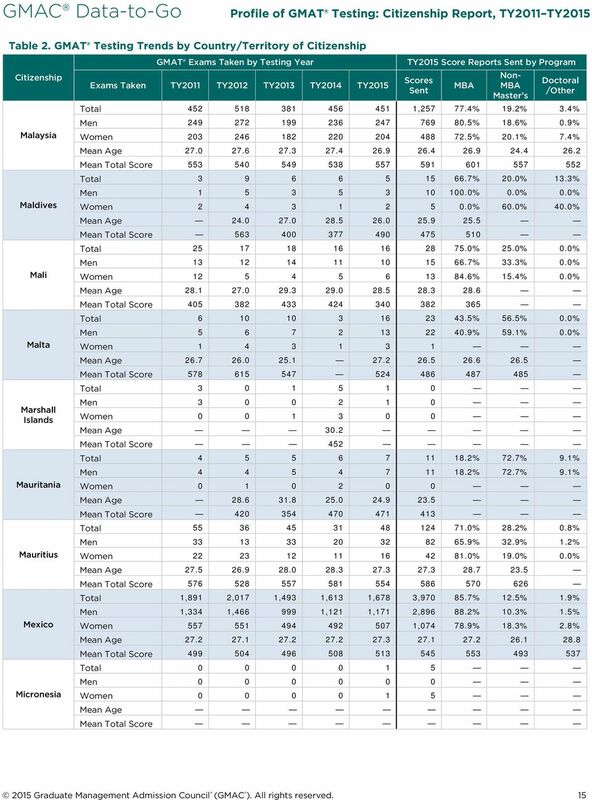 Download "What Can I Do With the Data?" 1 Profile of GMAT Testing: Report Five-Year Summary, TY2011 TY2015 November 2015 Globally, nearly 1.3 million Graduate Management Admission Test (GMAT ) exams have been taken over the past five years by individuals interested in pursuing graduate management education. The GMAT exam is an important part of the admissions process for more than 6,100 graduate management programs worldwide. A total of 247,432 GMAT exams were taken by prospective business school students around the world in testing year 2015 (TY2015), which ran from July 1, 2014 through June 30, These examinees sent a total of 600,415 score reports to graduate-level management programs across the globe. 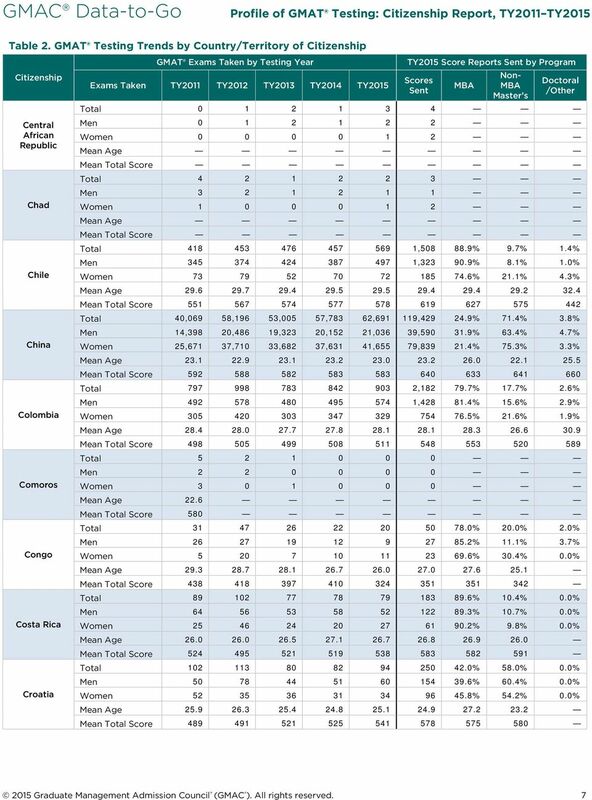 This report summarizes five-year global GMAT testing trends and includes: GMAT exams taken by citizenship, GMAT exams taken by gender, Mean age of GMAT examinees, Mean GMAT Total score, and GMAT score-sending breakdowns by program type (, non- master s, and doctoral/other), TY2015. 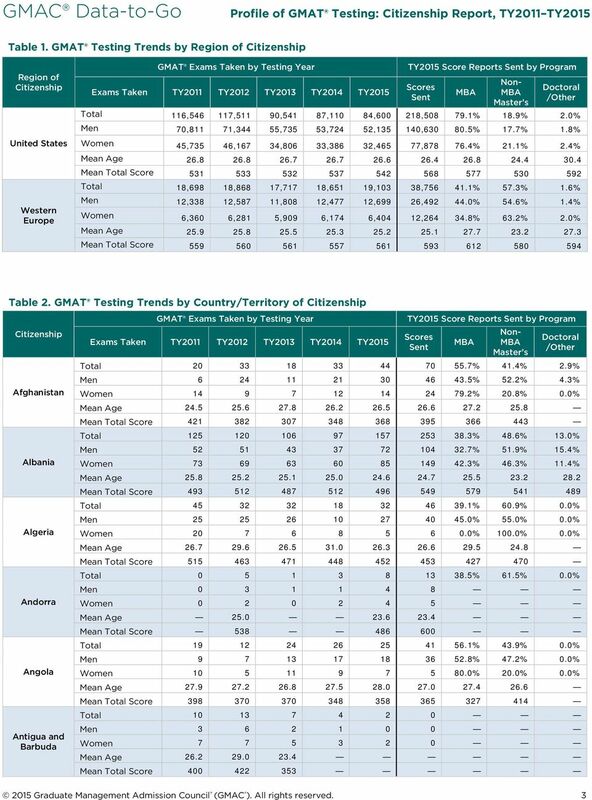 Mean GMAT Total scores and mean age of examinees are provided for citizenship groups with five or more exams taken and 10 or more score reports sent. What Can I Do With the Data? Use the data to build candidate profiles for specific country and regional groups. For example, using the tables you can determine the following about Indian citizens who sat for the GMAT exam in TY2015: Indian citizens sat for 29,042 GMAT exams. The mean age of Indian test takers was 26.1 and the mean GMAT Total score was 578. Of the 109,019 GMAT score reports sent by Indian citizens, 12.3 percent were directed to non- specialized master s programs. Indian men (87%) were somewhat more likely than Indian women (82%) to send scores to programs. Indian citizens represent 91 percent of GMAT testing by Central and South Asian citizens and 12 percent of global testing. This report is a starting point to target your search of potential students and enhance school recruitment efforts. For example, you can purchase names of prospective students using the Graduate Management Admission Search Service (GMASS ) database or develop profiles of the decision-making process for Indian candidates based on data in the mba.com Prospective Students Survey Interactive Report. See the back of this report for links to these and other resources. About the GMAT Exam The GMAT exam consists of four sections: Verbal, Quantitative, Analytical Writing, and Integrated Reasoning. 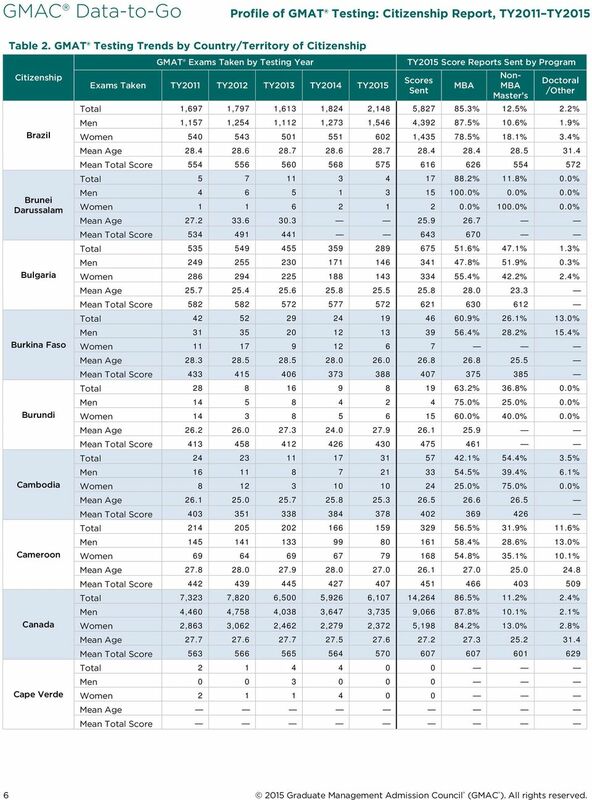 GMAT Total scores, as presented in this report, are calculated based on performance on the Verbal and Quantitative sections of the exam. Total scores are reported in increments of 10, on a scale ranging from 200 to 800. Results are valid for a five-year period from test sitting. 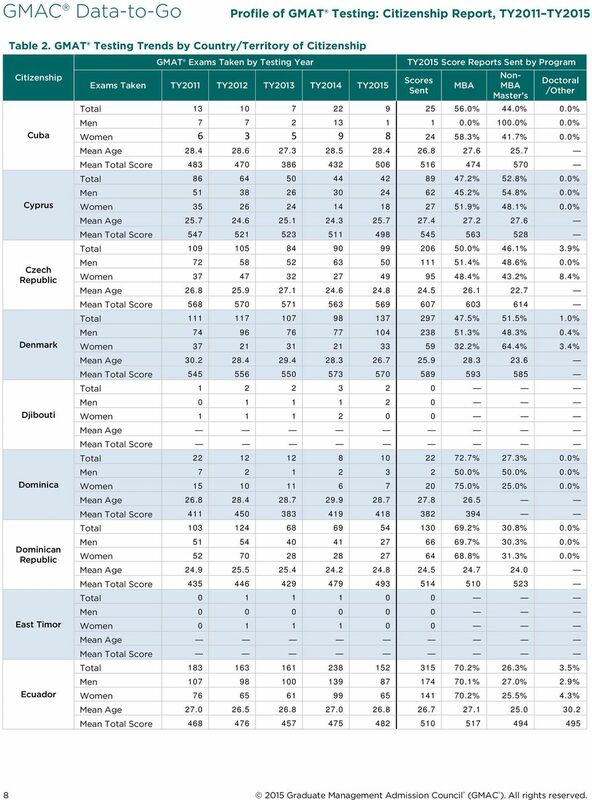 Please note that GMAT volume was artificially elevated in TY2012 as many examinees opted to sit for the exam before the addition of Integrated Reasoning (IR) in June About GMAT Examinees Data in this report reflect the total number of GMAT exams that generated valid Total scores during a given testing year. Test takers who took the exam more than once during the year are included in the aggregate data. For example, an individual who took the GMAT exam twice in TY2015 would represent a total of two exams taken during that year. Program data are based on a school s current GMAT code classifications for its respective programs. 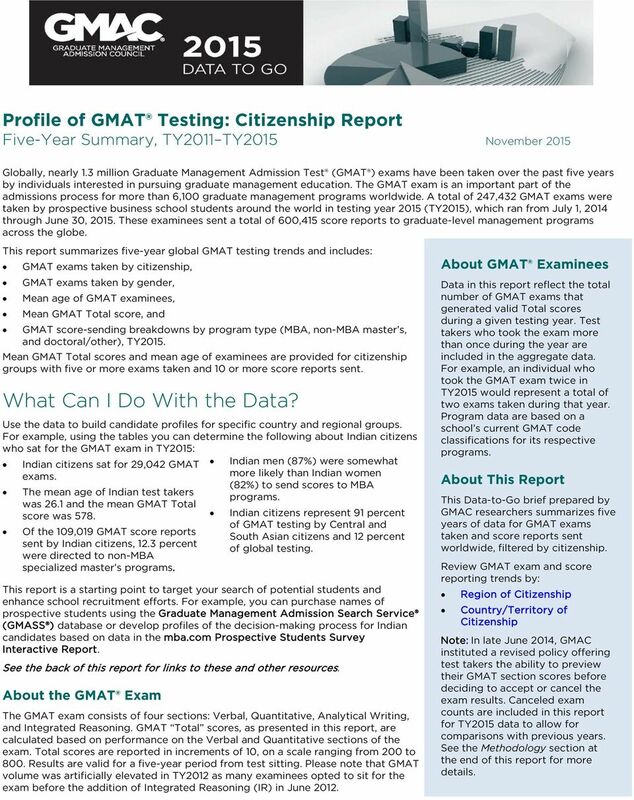 About This Report This Data-to-Go brief prepared by GMAC researchers summarizes five years of data for GMAT exams taken and score reports sent worldwide, filtered by citizenship. 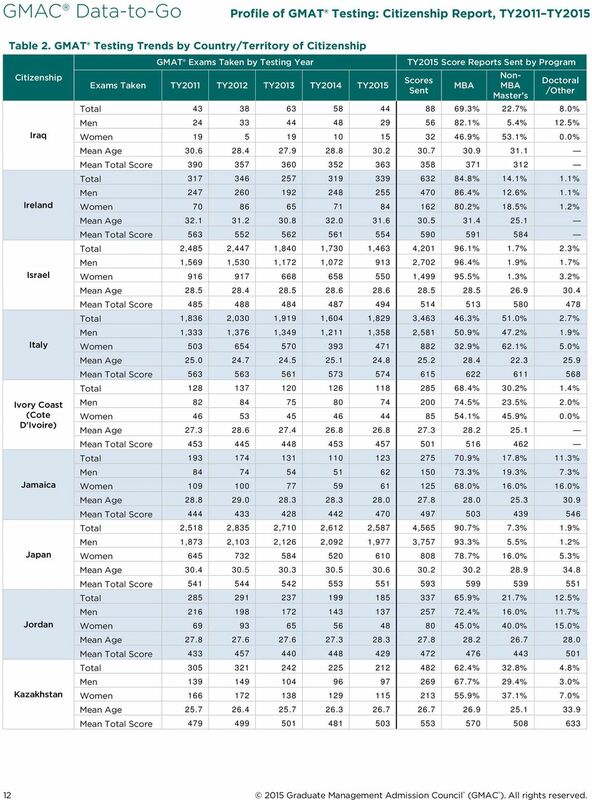 Review GMAT exam and score reporting trends by: Region of Country/Territory of Note: In late June 2014, GMAC instituted a revised policy offering test takers the ability to preview their GMAT section scores before deciding to accept or cancel the exam results. Canceled exam counts are included in this report for TY2015 data to allow for comparisons with previous years. See the Methodology section at the end of this report for more details. 2 Table 1. 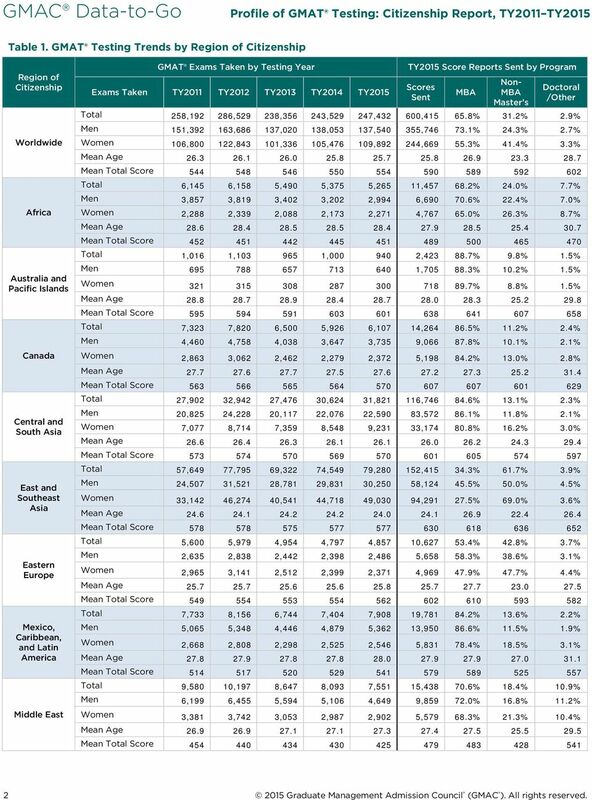 GMAT Testing Trends by Region of Region of Total 258, , , , , , % 31.2% 2.9% Men 151, , , , , , % 24.3% 2.7% Worldwide Women 106, , , , , , % 41.4% 3.3% Mean Age Mean Total Score Total 6,145 6,158 5,490 5,375 5,265 11, % 24.0% 7.7% Men 3,857 3,819 3,402 3,202 2,994 6, % 22.4% 7.0% Africa Women 2,288 2,339 2,088 2,173 2,271 4, % 26.3% 8.7% Mean Age Mean Total Score Total 1,016 1, , , % 9.8% 1.5% Australia and Pacific Islands Men , % 10.2% 1.5% Women % 8.8% 1.5% Mean Age Mean Total Score Total 7,323 7,820 6,500 5,926 6,107 14, % 11.2% 2.4% Men 4,460 4,758 4,038 3,647 3,735 9, % 10.1% 2.1% Canada Women 2,863 3,062 2,462 2,279 2,372 5, % 13.0% 2.8% Mean Age Mean Total Score Total 27,902 32,942 27,476 30,624 31, , % 13.1% 2.3% Central and South Asia Men 20,825 24,228 20,117 22,076 22,590 83, % 11.8% 2.1% Women 7,077 8,714 7,359 8,548 9,231 33, % 16.2% 3.0% Mean Age Mean Total Score Total 57,649 77,795 69,322 74,549 79, , % 61.7% 3.9% East and Southeast Asia Men 24,507 31,521 28,781 29,831 30,250 58, % 50.0% 4.5% Women 33,142 46,274 40,541 44,718 49,030 94, % 69.0% 3.6% Mean Age Mean Total Score Total 5,600 5,979 4,954 4,797 4,857 10, % 42.8% 3.7% Eastern Europe Men 2,635 2,838 2,442 2,398 2,486 5, % 38.6% 3.1% Women 2,965 3,141 2,512 2,399 2,371 4, % 47.7% 4.4% Mean Age Mean Total Score Total 7,733 8,156 6,744 7,404 7,908 19, % 13.6% 2.2% Mexico, Caribbean, and Latin America Men 5,065 5,348 4,446 4,879 5,362 13, % 11.5% 1.9% Women 2,668 2,808 2,298 2,525 2,546 5, % 18.5% 3.1% Mean Age Mean Total Score Total 9,580 10,197 8,647 8,093 7,551 15, % 18.4% 10.9% Men 6,199 6,455 5,594 5,106 4,649 9, % 16.8% 11.2% Middle East Women 3,381 3,742 3,053 2,987 2,902 5, % 21.3% 10.4% Mean Age Mean Total Score Graduate Management Admission Council (GMAC ). All rights reserved. 4 Table 2. GMAT Testing Trends by Country/Territory of Argentina Armenia Australia Austria Azerbaijan Bahamas Bahrain Bangladesh Barbados Total , % 12.5% 1.5% Men % 11.2% 0.9% Women % 17.0% 3.6% Mean Age Mean Total Score Total % 28.7% 7.3% Men % 24.3% 3.7% Women % 36.8% 14.0% Mean Age Mean Total Score Total , % 8.9% 1.1% Men , % 9.4% 1.2% Women % 7.7% 1.0% Mean Age Mean Total Score Total % 70.0% 3.7% Men % 64.1% 1.7% Women % 83.1% 8.1% Mean Age Mean Total Score Total % 35.5% 4.7% Men % 34.0% 1.6% Women % 39.8% 13.9% Mean Age Mean Total Score Total % 16.5% 0.0% Men % 16.7% 0.0% Women % 16.4% 0.0% Mean Age Mean Total Score Total % 13.6% 7.6% Men % 0.0% 3.3% Women % 25.0% 11.1% Mean Age Mean Total Score Total , % 36.6% 12.8% Men % 35.2% 12.0% Women % 39.4% 14.5% Mean Age Mean Total Score Total % 22.2% 18.5% Men % 18.2% 0.0% Women % 25.0% 31.3% Mean Age Mean Total Score Graduate Management Admission Council (GMAC ). All rights reserved. 6 Table 2. 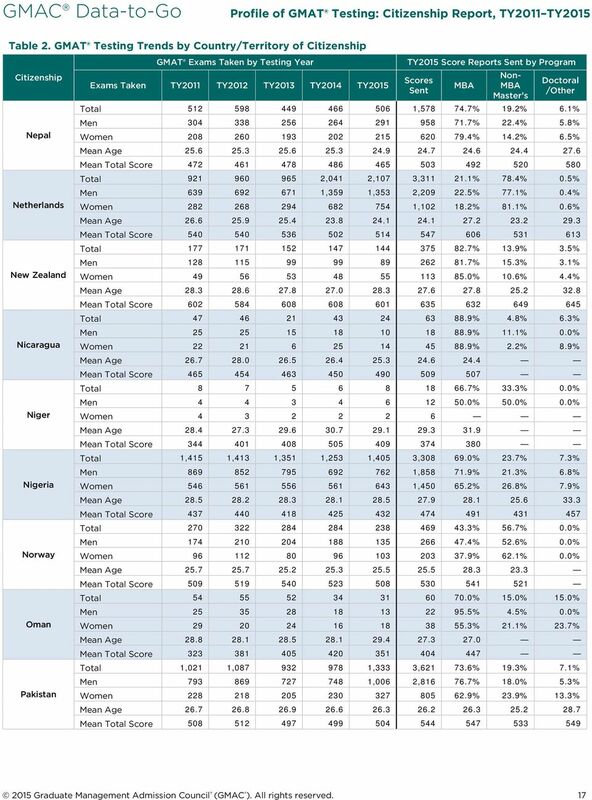 GMAT Testing Trends by Country/Territory of Brazil Brunei Darussalam Bulgaria Burkina Faso Burundi Cambodia Cameroon Canada Cape Verde Total 1,697 1,797 1,613 1,824 2,148 5, % 12.5% 2.2% Men 1,157 1,254 1,112 1,273 1,546 4, % 10.6% 1.9% Women , % 18.1% 3.4% Mean Age Mean Total Score Total % 11.8% 0.0% Men % 0.0% 0.0% Women % 100.0% 0.0% Mean Age Mean Total Score Total % 47.1% 1.3% Men % 51.9% 0.3% Women % 42.2% 2.4% Mean Age Mean Total Score Total % 26.1% 13.0% Men % 28.2% 15.4% Women Mean Age Mean Total Score Total % 36.8% 0.0% Men % 25.0% 0.0% Women % 40.0% 0.0% Mean Age Mean Total Score Total % 54.4% 3.5% Men % 39.4% 6.1% Women % 75.0% 0.0% Mean Age Mean Total Score Total % 31.9% 11.6% Men % 28.6% 13.0% Women % 35.1% 10.1% Mean Age Mean Total Score Total 7,323 7,820 6,500 5,926 6,107 14, % 11.2% 2.4% Men 4,460 4,758 4,038 3,647 3,735 9, % 10.1% 2.1% Women 2,863 3,062 2,462 2,279 2,372 5, % 13.0% 2.8% Mean Age Mean Total Score Total Men Women Graduate Management Admission Council (GMAC ). All rights reserved. 8 Table 2. 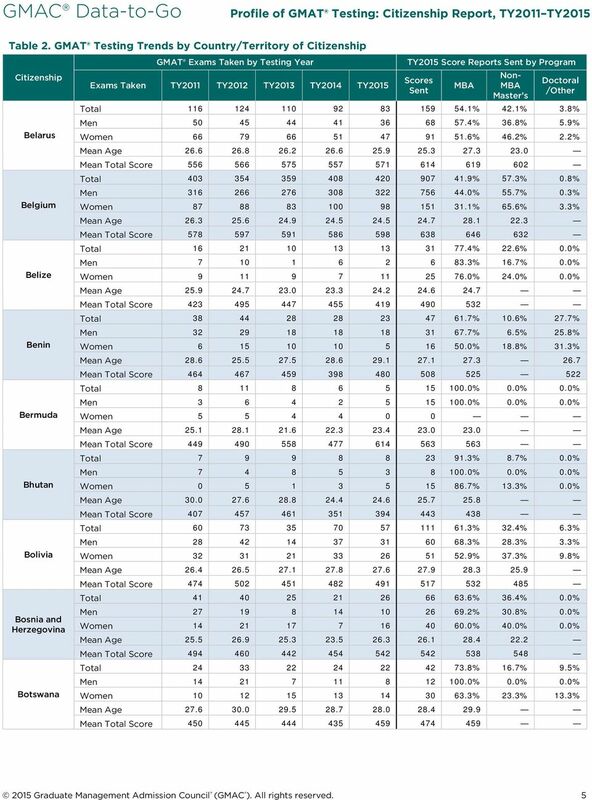 GMAT Testing Trends by Country/Territory of Cuba Cyprus Czech Republic Denmark Djibouti Dominica Dominican Republic East Timor Ecuador Total % 44.0% 0.0% Men % 100.0% 0.0% Women % 41.7% 0.0% Mean Age Mean Total Score Total % 52.8% 0.0% Men % 54.8% 0.0% Women % 48.1% 0.0% Mean Age Mean Total Score Total % 46.1% 3.9% Men % 48.6% 0.0% Women % 43.2% 8.4% Mean Age Mean Total Score Total % 51.5% 1.0% Men % 48.3% 0.4% Women % 64.4% 3.4% Mean Age Mean Total Score Total Men Women Total % 27.3% 0.0% Men % 50.0% 0.0% Women % 25.0% 0.0% Mean Age Mean Total Score Total % 30.8% 0.0% Men % 30.3% 0.0% Women % 31.3% 0.0% Mean Age Mean Total Score Total Men Women Total % 26.3% 3.5% Men % 27.0% 2.9% Women % 25.5% 4.3% Mean Age Mean Total Score Graduate Management Admission Council (GMAC ). All rights reserved. 10 Table 2. 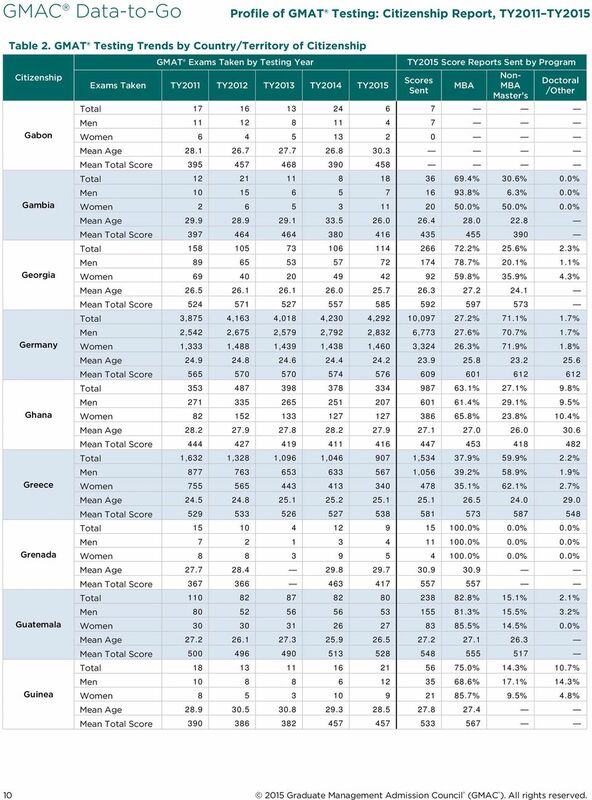 GMAT Testing Trends by Country/Territory of Gabon Gambia Georgia Germany Ghana Greece Grenada Guatemala Guinea Total Men Women Mean Age Mean Total Score Total % 30.6% 0.0% Men % 6.3% 0.0% Women % 50.0% 0.0% Mean Age Mean Total Score Total % 25.6% 2.3% Men % 20.1% 1.1% Women % 35.9% 4.3% Mean Age Mean Total Score Total 3,875 4,163 4,018 4,230 4,292 10, % 71.1% 1.7% Men 2,542 2,675 2,579 2,792 2,832 6, % 70.7% 1.7% Women 1,333 1,488 1,439 1,438 1,460 3, % 71.9% 1.8% Mean Age Mean Total Score Total % 27.1% 9.8% Men % 29.1% 9.5% Women % 23.8% 10.4% Mean Age Mean Total Score Total 1,632 1,328 1,096 1, , % 59.9% 2.2% Men , % 58.9% 1.9% Women % 62.1% 2.7% Mean Age Mean Total Score Total % 0.0% 0.0% Men % 0.0% 0.0% Women % 0.0% 0.0% Mean Age Mean Total Score Total % 15.1% 2.1% Men % 15.5% 3.2% Women % 14.5% 0.0% Mean Age Mean Total Score Total % 14.3% 10.7% Men % 17.1% 14.3% Women % 9.5% 4.8% Mean Age Mean Total Score Graduate Management Admission Council (GMAC ). All rights reserved. 12 Table 2. 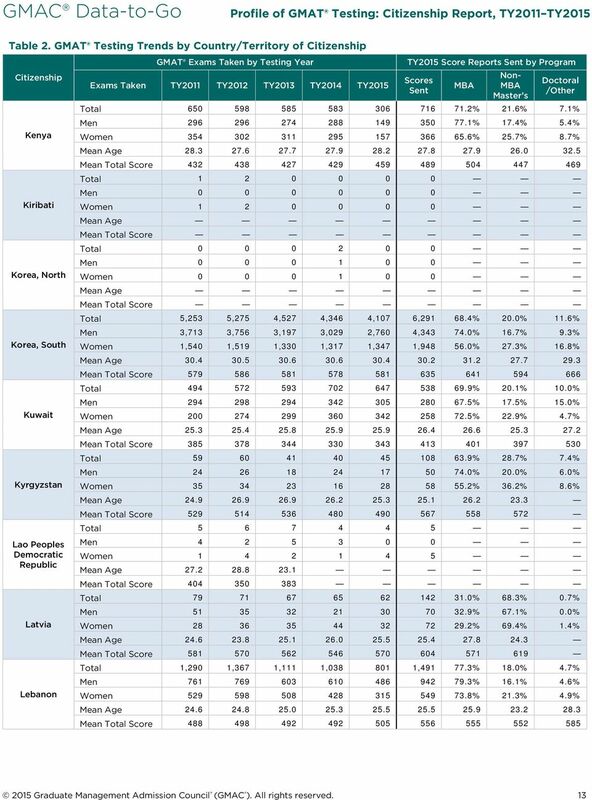 GMAT Testing Trends by Country/Territory of Iraq Ireland Israel Italy Ivory Coast (Cote D'Ivoire) Jamaica Japan Jordan Kazakhstan Total % 22.7% 8.0% Men % 5.4% 12.5% Women % 53.1% 0.0% Mean Age Mean Total Score Total % 14.1% 1.1% Men % 12.6% 1.1% Women % 18.5% 1.2% Mean Age Mean Total Score Total 2,485 2,447 1,840 1,730 1,463 4, % 1.7% 2.3% Men 1,569 1,530 1,172 1, , % 1.9% 1.7% Women , % 1.3% 3.2% Mean Age Mean Total Score Total 1,836 2,030 1,919 1,604 1,829 3, % 51.0% 2.7% Men 1,333 1,376 1,349 1,211 1,358 2, % 47.2% 1.9% Women % 62.1% 5.0% Mean Age Mean Total Score Total % 30.2% 1.4% Men % 23.5% 2.0% Women % 45.9% 0.0% Mean Age Mean Total Score Total % 17.8% 11.3% Men % 19.3% 7.3% Women % 16.0% 16.0% Mean Age Mean Total Score Total 2,518 2,835 2,710 2,612 2,587 4, % 7.3% 1.9% Men 1,873 2,103 2,126 2,092 1,977 3, % 5.5% 1.2% Women % 16.0% 5.3% Mean Age Mean Total Score Total % 21.7% 12.5% Men % 16.0% 11.7% Women % 40.0% 15.0% Mean Age Mean Total Score Total % 32.8% 4.8% Men % 29.4% 3.0% Women % 37.1% 7.0% Mean Age Mean Total Score Graduate Management Admission Council (GMAC ). All rights reserved. 14 Table 2. 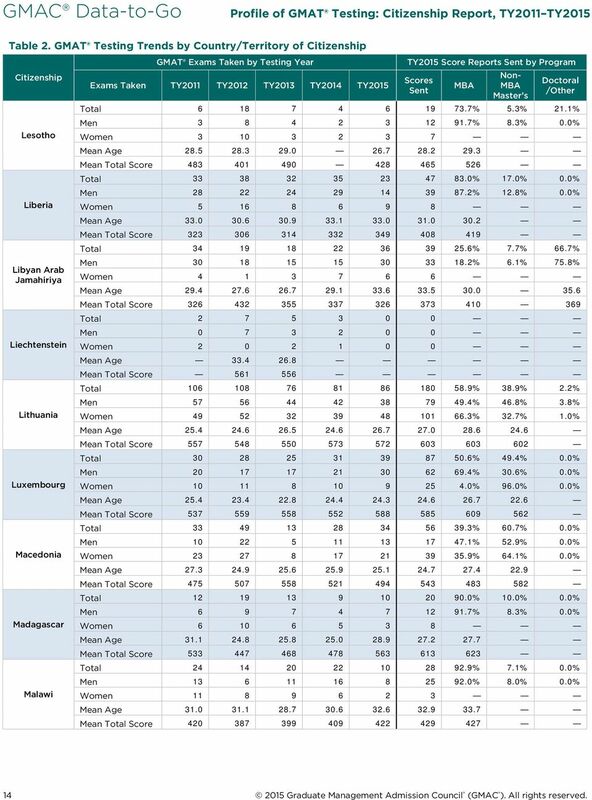 GMAT Testing Trends by Country/Territory of Lesotho Liberia Libyan Arab Jamahiriya Liechtenstein Lithuania Luxembourg Macedonia Madagascar Malawi Total % 5.3% 21.1% Men % 8.3% 0.0% Women Mean Age Mean Total Score Total % 17.0% 0.0% Men % 12.8% 0.0% Women Mean Age Mean Total Score Total % 7.7% 66.7% Men % 6.1% 75.8% Women Mean Age Mean Total Score Total Men Women Mean Age Mean Total Score Total % 38.9% 2.2% Men % 46.8% 3.8% Women % 32.7% 1.0% Mean Age Mean Total Score Total % 49.4% 0.0% Men % 30.6% 0.0% Women % 96.0% 0.0% Mean Age Mean Total Score Total % 60.7% 0.0% Men % 52.9% 0.0% Women % 64.1% 0.0% Mean Age Mean Total Score Total % 10.0% 0.0% Men % 8.3% 0.0% Women Mean Age Mean Total Score Total % 7.1% 0.0% Men % 8.0% 0.0% Women Mean Age Mean Total Score Graduate Management Admission Council (GMAC ). All rights reserved. 16 Table 2. 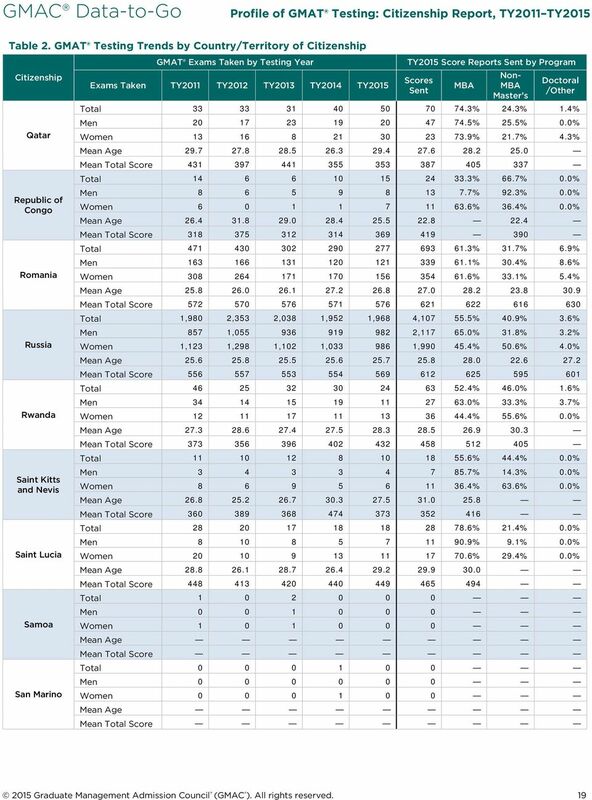 GMAT Testing Trends by Country/Territory of Moldova Monaco Mongolia Montenegro Morocco Mozambique Myanmar Namibia Nauru Total % 41.1% 2.2% Men % 46.2% 1.3% Women % 37.3% 2.9% Mean Age Mean Total Score Total Men Women Mean Age Mean Total Score Total % 24.6% 4.2% Men % 10.6% 6.4% Women % 27.7% 3.8% Mean Age Mean Total Score Total % 72.7% 0.0% Men % 70.0% 0.0% Women % 75.0% 0.0% Mean Age Mean Total Score Total % 51.0% 4.4% Men % 49.5% 4.4% Women % 52.7% 4.5% Mean Age Mean Total Score Total % 18.8% 0.0% Men Women Mean Age Mean Total Score Total % 16.9% 0.0% Men % 16.2% 0.0% Women % 17.4% 0.0% Mean Age Mean Total Score Total % 0.0% 0.0% Men % 0.0% 0.0% Women Mean Age Mean Total Score Total Men Women Graduate Management Admission Council (GMAC ). All rights reserved. 18 Table 2. 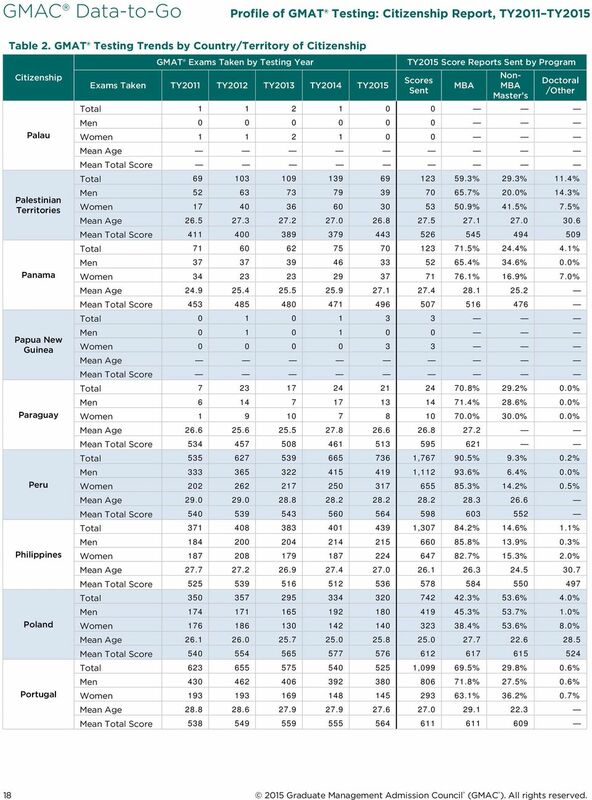 GMAT Testing Trends by Country/Territory of Palau Palestinian Territories Panama Papua New Guinea Paraguay Peru Philippines Poland Portugal Total Men Women Total % 29.3% 11.4% Men % 20.0% 14.3% Women % 41.5% 7.5% Mean Age Mean Total Score Total % 24.4% 4.1% Men % 34.6% 0.0% Women % 16.9% 7.0% Mean Age Mean Total Score Total Men Women Total % 29.2% 0.0% Men % 28.6% 0.0% Women % 30.0% 0.0% Mean Age Mean Total Score Total , % 9.3% 0.2% Men , % 6.4% 0.0% Women % 14.2% 0.5% Mean Age Mean Total Score Total , % 14.6% 1.1% Men % 13.9% 0.3% Women % 15.3% 2.0% Mean Age Mean Total Score Total % 53.6% 4.0% Men % 53.7% 1.0% Women % 53.6% 8.0% Mean Age Mean Total Score Total , % 29.8% 0.6% Men % 27.5% 0.6% Women % 36.2% 0.7% Mean Age Mean Total Score Graduate Management Admission Council (GMAC ). All rights reserved. 20 Table 2. GMAT Testing Trends by Country/Territory of Sao Tome and Principe Saudi Arabia Senegal Serbia Serbia and Montenegro Seychelles Sierra Leone Singapore Slovakia Total Men Women Total 2,018 2,663 2,375 2,198 2,400 4, % 30.1% 9.8% Men 1,541 1,910 1,745 1,529 1,601 2, % 27.7% 9.3% Women , % 35.1% 10.8% Mean Age Mean Total Score Total % 29.2% 9.2% Men % 35.3% 21.6% Women % 24.6% 0.0% Mean Age Mean Total Score Total % 47.1% 5.5% Men % 37.7% 4.3% Women % 58.1% 6.8% Mean Age Mean Total Score Total Men Women Mean Age Mean Total Score Total Men Women Total % 54.5% 0.0% Men Women Mean Age Mean Total Score Total 1,251 1, , % 26.1% 2.0% Men , % 26.1% 1.5% Women % 26.1% 2.7% Mean Age Mean Total Score Total % 59.0% 1.9% Men % 67.8% 3.4% Women % 47.8% 0.0% Mean Age Mean Total Score Graduate Management Admission Council (GMAC ). All rights reserved. 22 Table 2. 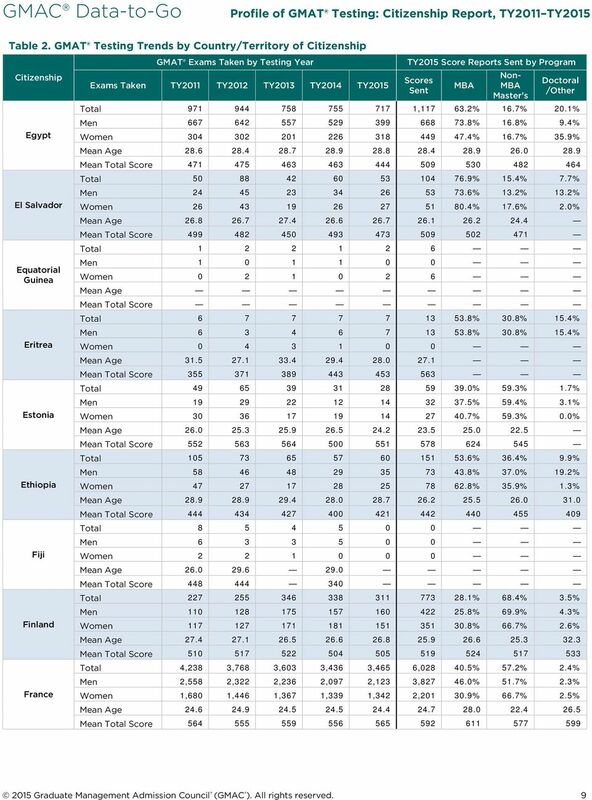 GMAT Testing Trends by Country/Territory of Suriname Swaziland Sweden Switzerland Syrian Arab Republic Taiwan Tajikistan Tanzania Thailand Total Men Women Mean Age Mean Total Score Total Men Women Mean Age Mean Total Score Total , % 84.8% 0.4% Men , % 83.0% 0.6% Women % 87.6% 0.1% Mean Age Mean Total Score Total % 51.0% 1.0% Men % 48.9% 0.5% Women % 58.7% 3.0% Mean Age Mean Total Score Total % 21.8% 6.7% Men % 24.3% 8.8% Women % 14.0% 0.0% Mean Age Mean Total Score Total 3,449 4,232 3,163 3,404 3,528 6, % 47.5% 3.0% Men 1,467 1,687 1,343 1,459 1,525 2, % 42.0% 3.5% Women 1,982 2,545 1,820 1,945 2,003 3, % 51.5% 2.6% Mean Age Mean Total Score Total % 33.9% 4.8% Men % 25.0% 10.7% Women % 41.2% 0.0% Mean Age Mean Total Score Total % 17.6% 12.7% Men % 15.1% 13.2% Women % 25.0% 11.1% Mean Age Mean Total Score Total 1,864 2,207 1,735 1,816 1,790 3, % 22.5% 2.6% Men , % 22.2% 2.7% Women 1,079 1,267 1,006 1,050 1,061 1, % 22.8% 2.5% Mean Age Mean Total Score Graduate Management Admission Council (GMAC ). All rights reserved. 24 Table 2. GMAT Testing Trends by Country/Territory of United Kingdom United States Uruguay Uzbekistan Vanuatu Venezuela Vietnam Yemen Zambia Total 1,623 1,746 1,560 1,654 1,563 3, % 18.9% 0.9% Men 1,175 1,323 1,158 1,200 1,093 2, % 18.4% 1.1% Women , % 19.9% 0.4% Mean Age Mean Total Score Total 116, ,511 90,541 87,110 84, , % 18.9% 2.0% Men 70,811 71,344 55,735 53,724 52, , % 17.7% 1.8% Women 45,735 46,167 34,806 33,386 32,465 77, % 21.1% 2.4% Mean Age Mean Total Score Total % 9.9% 6.2% Men % 9.8% 4.5% Women % 10.2% 10.2% Mean Age Mean Total Score Total % 27.7% 7.6% Men % 31.7% 6.8% Women % 12.3% 10.5% Mean Age Mean Total Score Total % 0.0% 0.0% Men % 0.0% 0.0% Women Mean Age Mean Total Score Total , % 13.3% 2.8% Men % 13.2% 4.3% Women % 13.3% 0.0% Mean Age Mean Total Score Total 1,216 1,360 1,310 1,455 1,501 3, % 41.4% 5.4% Men , % 41.5% 7.2% Women , % 41.3% 4.4% Mean Age Mean Total Score Total % 28.6% 19.0% Men % 10.0% 20.0% Women % 45.5% 18.2% Mean Age Mean Total Score Total % 12.9% 10.0% Men % 17.6% 9.8% Women % 0.0% 10.5% Mean Age Mean Total Score Graduate Management Admission Council (GMAC ). All rights reserved. 133 Countries Mexicans Can Travel To Without Visa. Mexican passports may actually have a lot more value than what you accord it at the moment.